0:00 You can import an mp3 or wav audio file into your scripted recording which makes it convenient to have a voiceover done by a 3rd party. 0:09 Clicking this icon on any section of your scripted recording and then selecting an audio file from your computer allows you to import audio for that section only. 0:19 If you want to replace the audio for a section you can click the dropdown here and then click Import Audio to select your audio file. 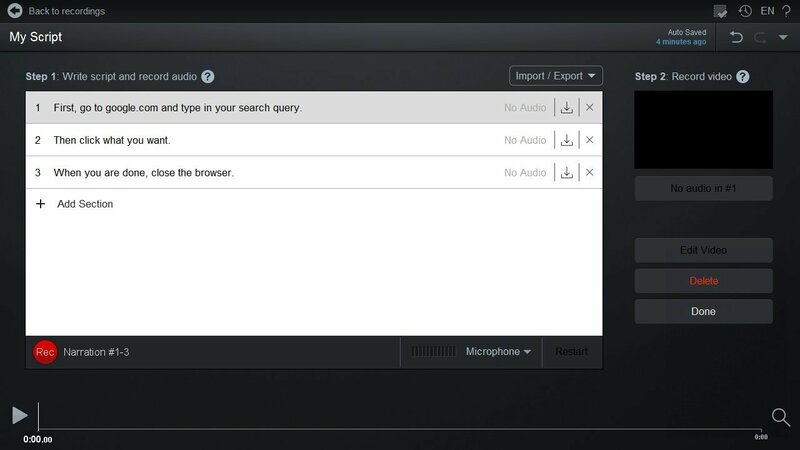 0:27 You can also create an audio file for your entire scripted recording. You will need to separate each section of audio with at least 2 seconds of silence which the app will detect and use to split your audio into sections. 0:41 To import audio for the entire recording you click the Import/Export dropdown here. Click Import Audio then Choose Audio File to select your mp3 or wav file to import. 0:55 For example, when we select this audio file and import, you can see each section of audio is delimited by the silence detected by the app. 1:04 After you have imported an audio file, you can edit silences as normal which we cover in another tutorial	1:11 That's it for this tutorial on importing audio. For more help, make sure to reference our tutorial channel dedicated to scripted recordings on help.screencast-o-matic.com.